Look what the man from Parcelforce just dragged in, (well actually it was Oli Parcelforce blokey wouldn't take the box down "those steps") it's the very lovely new 2012 Scott CX Comp. 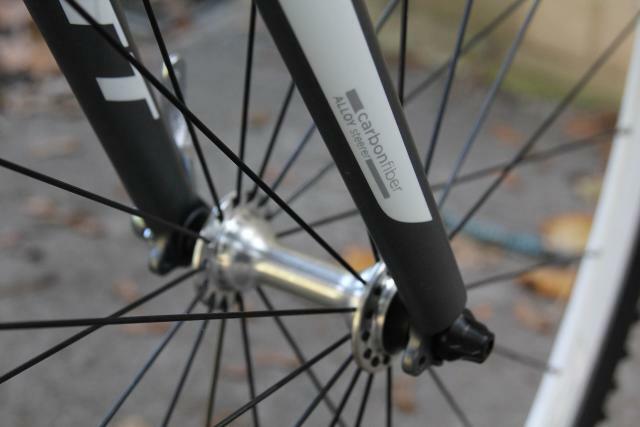 The Comp is very much a cross bike that's built for racing rather than as an all rounder, although like all 'cross bikes it's an innately versatile machine and while list price on the 2012 version is £1099 we're pretty sure plenty of shops will be offering it at a cycle to work scheme-friendly £999.99. 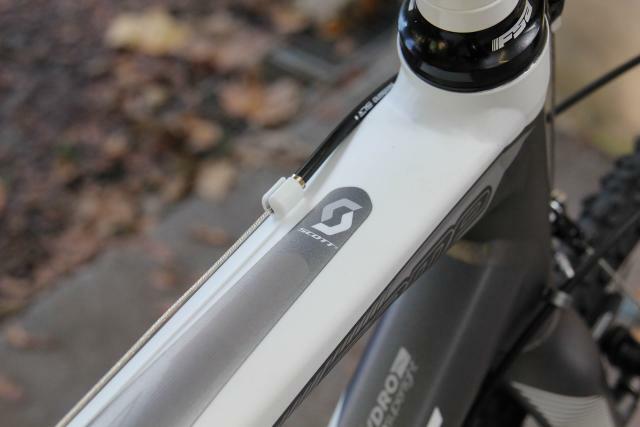 Last year Scott gave the Comp, and it's stablemate the more expensive Team, a new 6061 frame that included neat touches like an ergonomically shaped top tube for more comfortable shouldering and replacing the chainstay bridge with two diagonal struts for more muddy wheel clearance. They didn't mess with the geometry though which is pretty much classic cross bike and ranges from 70°head/74°seat for the small, right through to 71°head and 73°seat for the XL three sizes up. This year they've turned their attention to the spec with some welcome upgrades and a noticeable drop in claimed weight. The 2011 Comp had a claimed weight of 10 Kg (22lb), the 2012 model comes in at 9.48Kg (20.88lb), we're guessing that's for the medium, our Big Dave-sized XL tips the scales at a creditable 9.71Kg (21.4lb). Less weight and more gears for 2012 the Comp gets a 10-spd drivetrain courtesy of a combination of Shimano 105 and Tiagra componentry. The rear mech is 105 while the front mech and shifters are Tiagra, the 12-30 10 speed cassette is Tiagra again while the brakes are Tektro's cyclocross offerings and that's cantis not discs. 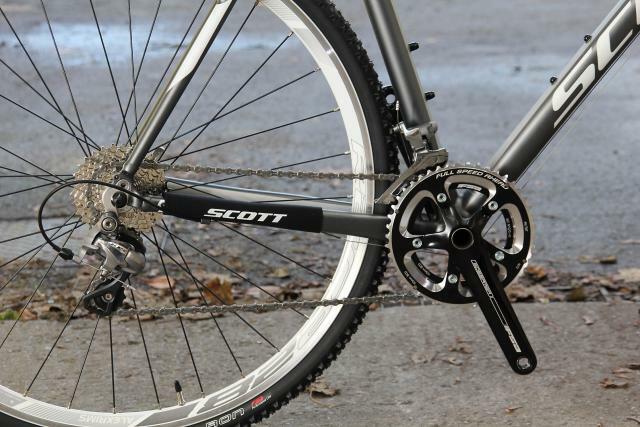 Probably nothing though states the Comp's full on race intentions more than the FSA Gossamer CX 46 - 36 chainset, yes a 50 - 34 compact offers more all round versatility but most mortal people would find that a tad over-geared for your typical cyclocross race. Wheels look to be the same as last year, Alex Race 28 hole aero rims at the front 32 hole at the back laced up to Shimano Tiagra hubs via DT Swiss 2mm spokes. 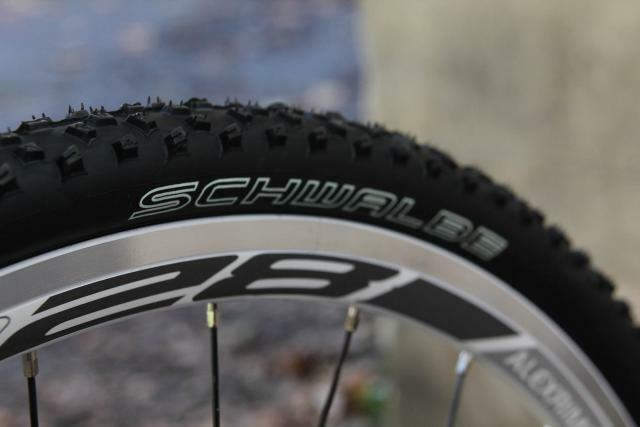 According to the Scott website the tyres are Schwalbe Black Jacks, according to the tyres on our bike though they're Schwalbe Rocket Rons - great name, which if they are standard issue are a considerable upgrade on the Black Jacks. As mentioned up top, although this is more of a race bike, being a cross bike it's still a versatile beast and the Comp frame boasts a some discrete enhancements to aid that versatility. 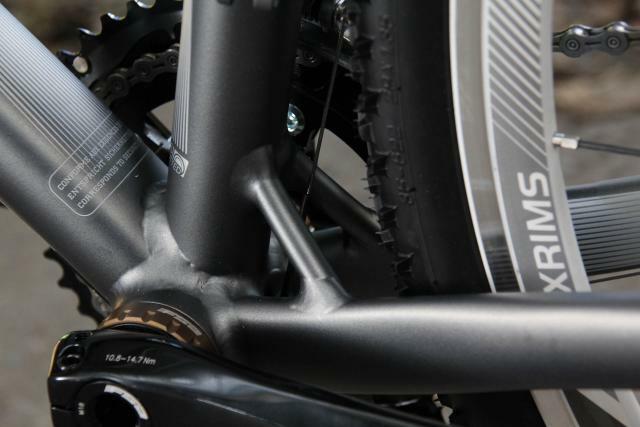 Basically that means you can fit mudguards courtesy of eyelets on the front fork and rear dropout and a concealed mounting point on the seatstay bridge. Nice.